Ask fellow campers about "Ripplin Waters Campground" and nearby attractions. Stayed a few nights during Wing Ding. Park was nice, got crowded for Labor Day weekend. Nearby Pigeon Forge and Gatlinburg are very busy towns. We camped at Ripplin Waters Campground in a Motorhome. The park was clean with well-groomed gravel roads. The sites are typically spaced for parks having sewer service in a popular area. By this I mean there is a narrow strip of grass between sites. The back-in sites along the river have a great view and most have a very nice concrete pad next to the drive. This park also has cable TV although the picture quality was not too good. We camped at Ripplin Waters Campground in a Motorhome. Highly recommend the river sites if you don't mind a back-in site. Sites are gravel, two to a pull thru, back to back, and narrow. Our patio looked at the back of the rig next to us and their sewer. Only the riverside sites had concrete patios, the others did not. The restrooms and pool are older but very clean and sparkling, same with the laundry room. 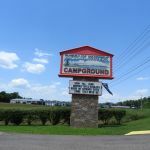 The campground is only 5 miles south of the Interstate so you don't have to drive the rig thru heavy traffic in Pigeon Forge. We were able to use our satellite and our ATT worked well. We camped at Ripplin Waters Campground in a Motorhome. We had stayed here several years ago and were not impressed but decided to stay while we were in the area this year. What a difference. Nearly a 180 degree turn-around. 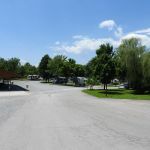 The campground was well-tended, the office staff very helpful, the restrooms had been cleaned up and painted and we really enjoyed our stay. The entire area has changed with its proximity to Pigeon Forge and The Great Smokies National Park. Exercise patience - the highway is under construction so you may be in traffic for some time, both getting to and leaving the RV park. We would return. We camped at Ripplin Waters Campground in a Fifth Wheel. There is plenty of shopping, amusement parks, and other tourist attractions. You can even drive through the National Park and gain access to the Blue Ridge Parkway. Restaurants offer about any cuisine you are interested in. You shouldn't get bored! We stayed 3 nights in a 5th Wheel. Sites are nice size with lots of pull through and level back-in sites. Campground was very well maintained and clean. Restrooms and laundry also clean and well maintained. The campground is located just off the main road. The office is easy to spot from the road and the campground itself is located slightly downhill, creating a fairly quit remote feeling. 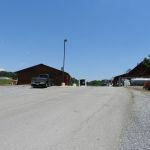 Roads and camp sites are gravel with concrete patios and picnic tables on sites. The office personnel and maintenance person were very friendly and accommodating. The WIFI was a little shaky, but okay for simple emails. The location from Pigeon Forge and Gatlinburg was good for this visit. We would recommend and absolutely plan to stay on the return trip. We camped at Ripplin Waters Campground in a Fifth Wheel. Pigeon Forge and Gatlinburg within about 8-12 miles. Food fest, ice cream, fudge, taffy, buffets, touristy food places, lots of T-shirt shops etc. Lots of souvenir shops, "resort wear etc" if your into that sort of thing. Good value for the location and good condition of facilities as a whole. Nice park, very friendly and helpful at the front desk. We were met at our site and again were made to feel welcome. We soon realized that location was a big plus. It's just off I-40 before you get too far into the horrendous traffic through Sevierville, Pigeon Forge, and Gatlinburg. Tough enough sitting in traffic in your car, but navigating that congestion with an RV would be much worse. Park was clean, and with our Good Sam card the price was good given the heavy tourist interest. Folks were friendly and we went to a church service at the pavilion sponsored by a local congregation. Only problem was with spotty Wi-Fi performance. I wouldn't be in a hurry to go to that area again, but if we did I'd definitely return to Ripplin. We camped at Ripplin Waters Campground in a Motorhome. My family loved the park. It was clean and quiet. The river site was great. It needs a better playground for the kids, but overall it is a great park for the money. We camped at Ripplin Waters Campground in a Travel Trailer. Good campground we were backed up to a river friendly staff nice level sites. With construction you can only enter the park from one direction and the helicopter rides across the street are noisy. Showers and laundry are not close to any campsite. We camped at Ripplin Waters Campground in a Fifth Wheel. The Good 1) Staff is friendly 2) Close to lots of entertainment 3) Bathrooms are pristine 4) River is nice The not so good 1) No privacy whatsoever 2) sites too close together 3) Internet keeps dropping out and slow (I am on it now) 4) Older folks in big rigs the norm. We camped at Ripplin Waters Campground in a Travel Trailer. This campground is a little far out to be used to see Gatlinburg. However, it is within a reasonable distance for going to one of the two main Flea Markets. The smaller of the two is within walking distance. The sites seem to be laid out in an efficient manor. All the sites look to be mostly level. The site (#80) we were in, needed just a little bit of leveling. Most all sites come with a picnic table and they all look to be in good shape. Some of the river sites come with a concrete pad that the table sits on. Plus, some of the river sites have a built in grill. There are no fire rings in this campground. The WiFi worked but was spotty at times. The pool was of good size and looked to be in good repair. There were not enough chairs and table for the number of sites in the campground. The roads were all gravel and were not dusty at all. The river is all but useless. It is too steep to go down to and looks snaky as well. The bathhouse was in good shape but this campground could use another one for the amount of sites they have. We did not use the cable TV. The sewer drained well and the water they had was ok. The only thing I can complain about it the helicopters that flew overhead. There was a tour company just across the hwy. Also, getting back out was a little trouble. You have to make a right and find a place to turn around to get back to the interstate. The owners were more than pleasant to deal with. This campground does not allow tents. We camped at Ripplin Waters Campground in a Motorhome. We stopped there coming down westbound from the Smoky Mountains National Park. This place is quiet even if it is near a main road. Owners are friendly. The restrooms and showers are ultra clean. Lots of trees in the campground but bushes between sites would be great for a little privacy. We would stop there again. We camped at Ripplin Waters Campground in a Motorhome. This was our second trip to the Gatlinburg area where we stayed for 2 nights. The park is actually a little off the road and that was very nice for the peace and quiet we like when camping. The sites were very close together, which wasn't optimal, and there weren't very many trees. We usually request shady sites. The park wasn't full, so we didn't have someone right next to us, which made it better. The restrooms and showers were excellent, clean and nicely organized. The check-in person the next morning seemed to have no idea that we changed to a spot next to the one we were assigned, and she didn't have a clue who we were or if we had a reservation, completely misspelled our name despite the fact that I spelled it repeatedly for her on the phone. This park is convenient for Gatlinburg sites, convenient for the interstate and quiet. It is clean and has all the amenities we usually need and want in a park and was just fine for a couple days stop. We camped at Ripplin Waters Campground in a Travel Trailer. Very nice level park. It is all gravel with grass patio areas, but not dusty at all. Pool and park are decent. Only complaint is that it is directly across from a helicopter tour company, but you get used to them. It's up away from the action...but also away from the traffic. We camped at Ripplin Waters Campground in a Travel Trailer. Nice park for quick stops. Overall well taken care of. We camped at Ripplin Waters Campground in a Fifth Wheel. Cable was not working well. Got more stations on antennae. Wireless not working well. Had to move site and then took a couple of days for them to reboot system We camped at Ripplin Waters Campground in a Motorhome. Mountains, shopping, theme parks. There are tons of things to do here. Close to the hustle of Pigeon forge, TN but far enough away to enjoy this quiet little campground. Just about 1-2 miles from the Knife Store. Scenic Helicopter rides were directly across the street. BQ restaurant was in walking distance and delicious. 30 minutes to Knoxville. Gatlinburg was a fun place to spend a day. Be sure to try the moonshine tasting at the distillery. Also, walking around the knife store is an awesome way to spend the afternoon. Had no idea there were so many knives available to purchase. It is Sevierville - so it's close to everything. Best food we found was at JT Hannah's Kitchen. Even better than the food was the prices - VERY reasonable. Husband's steak was so good he sent tip to the kitchen. Worlds largest knife store nearby! Are you affiliated with Ripplin Waters Campground ?